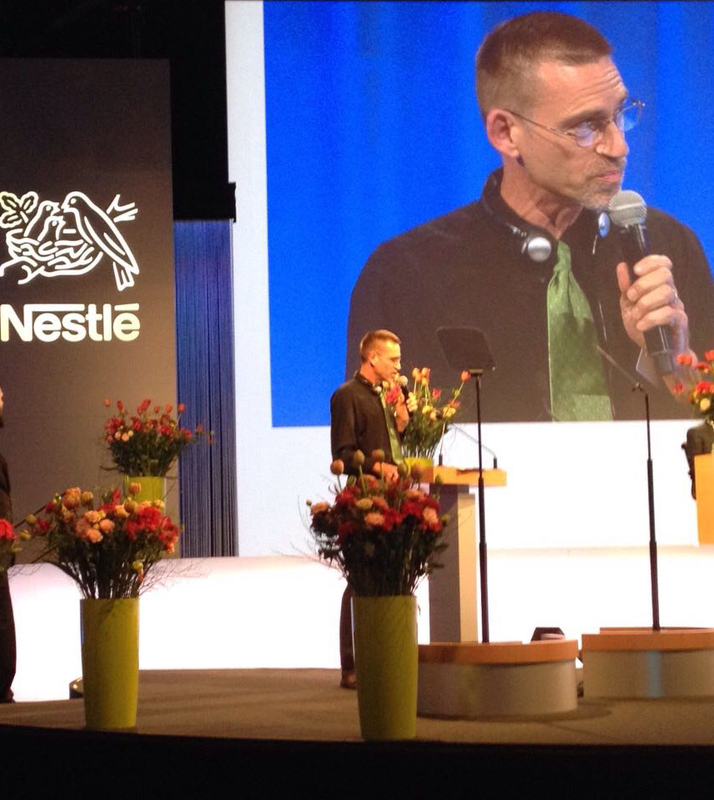 Baby Milk Action’s Campaigns Coordinator asks Nestlé Chairman, Peter Brabeck-Letmathé, to drop the public relations approach and address people’s concerns before he retires. He has attempted to rebrand the company as a Nutrition, Health and Wellness company, but many people see Nestlé as a Malnutrition, Death and Water Stealing company. Last year a survey found it to be the least ethical company of the past 25 years, which will otherwise be his legacy. There were 2446 shareholders present to hear the intervention, representing 73.5% of voting rights. IBFAN was the only campaign group raising concerns about Nestlé’s business practices (donate – you give us power). Mike Brady, Baby Milk Action, the UK member of the International Baby Food Action Network (IBFAN). I am also speaking on infant nutrition [following Camille Seleger of IBFAN-GIFA], but it is very relevant given what we have just heard from the board [Nestlé Nutrition Head cited Nestlé inclusion in FTSE4Good ethical investment index and Nestlé’s promotion of breastfeeding in its first 1000 days campaigns]. Shareholders, no such analysis has been posted to date. I checked again this morning. It is still being promised. Mr Chairman, the fact your policies generate such violations is why we are calling on you to change them. Rather than address the real issue, last year you put on the screen a leaflet saying you are working in partnership with an IBFAN group. This group first told us it did not work with corporations, but left our network after Nestlé claimed to have a video of the Executive Director. Perhaps you have the video to show this year. The group says it now has no time to monitor and report on Nestlé’s activities. This is an essential part of IBFAN’s work and so it is no longer an IBFAN group. Is this what Nestlé means by partnership? Persuading groups to stop monitoring and reporting? IBFAN will not stop. And we continue to find violations. Right now in India Nestlé is targeting nurses in breach of Indian legislation. 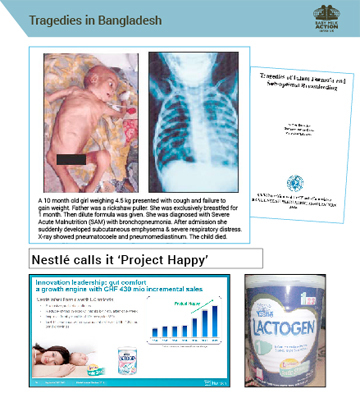 In Bangladesh you promote infant formula with the claim it is the ‘gentle start’ for babies. Nestlé calls this marketing strategy an ‘engine for growth’. You know babies die from unsafe bottle feeding. Yet you promote formula claiming it ‘protects’ babies and put company profits first. FTSE has told you directly in the past to not misrepresent inclusion in the FTSE4Good Index as compliance with the WHO Code. Targeting parents by hijacking the first 1000 days initiative and targeting teenage girls through nutrition education are clear violations of World Health Assembly rules and the EU Action Plan on Childhood Obesity. Last year, Nestlé was voted the most unethical company of the past 25 years by readers of Ethical Consumer Magazine. As Chairman and previous Chief Executive this is very much your personal legacy. I hope shareholders will think carefully about the human cost of the policies you pursue and the damage to Nestlé’s image when it comes to your re-election. If you are returned, Mr Chairman, why not drop the failed public relations strategies and make the changes people want to see before your retire? That is my request to you. And it is true that there are 309,000 people who are working for us around the world and there are places where we are not 100% according to the rules. I think in the past 18 months we’ve heard of 19 incidents, 19 incidents have been reported, where there were minor to slightly larger violations of OUR RULES AND PRINCIPLES across the world [emphasis added]. But where I object is the way in which you continue to divulge and disclose across the world [.] You don’t want to see the other’s position. That’s what’s the problem I have with IBFAN. I don’t mind that you monitor our activities. On the contrary, we’re grateful. It’s the other side. When you’re wrong you never admit to it. When you’re in the wrong you don’t admit to it and that completely undermines your credibility. That’s your problem. [Applause from some shareholders]. So you still defend claiming that formula ‘protects’ babies and is the ‘gentle start’. You talk about Nestlé’s principles. What you should be following are the marketing requirements adopted by the World Health Assembly. That was the point I started with. Nestlé’s policies are weaker and narrower that the requirements you are supposed to be following. And that is why we are asking you to change. That is why you say 90% of these things are allowed by your policies. Because your policies are wrong. Well, thank you very much, Mr Brady. I’m sure we’ll see you again next year and we look forward to welcoming you again. Help Baby Milk Action keep up the pressure on Nestlé at shareholder meetings and throughout the year. We have forced some changes. For example, following a campaign in October 2014, Nestlé finally agreed to stop claiming its formula is the ‘natural start’ for babies.